The paint is all original with exception of the front half of the rear fender, nicely repainted and correctly restripped many years ago. 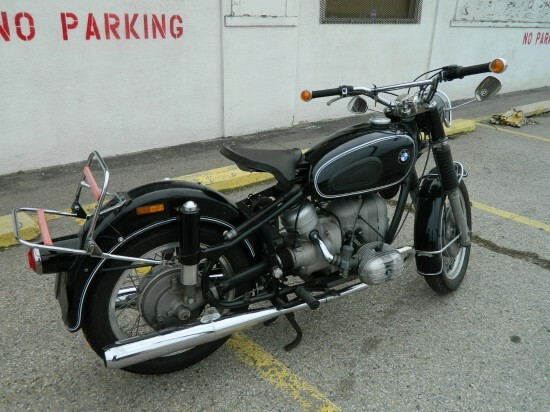 The hydraulic steering damper, tank (two badges and tank interior both perfect), seat (perfect), headlamp, wiring harness, horn, exhaust, carbs, and fenders are all original to this bike, the rims and spokes are original and in fine condition, and new tires were mounted in 2012. 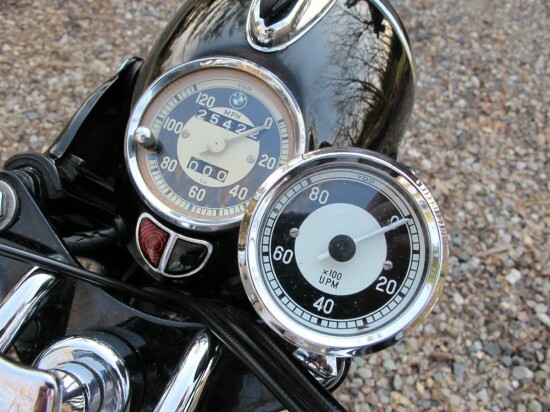 In the past I’ve placed a factory original VDO labelled oil pump gear tachometer, dated to 1969 and fully functional, added an original Albert bar end mirror of the early type, replaced the carburetor float chamber covers with lever tops, and replaced the original Everbest petcock with a more practical Germa petcock. 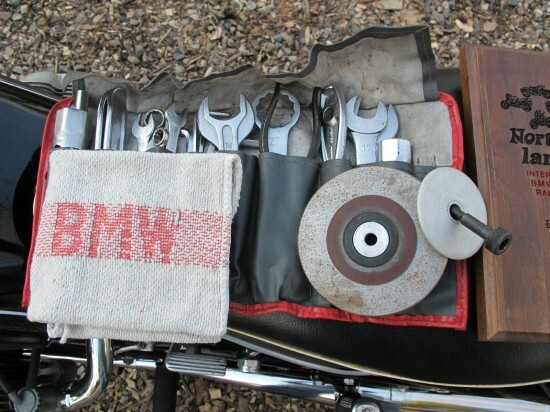 Included in the auction are the original tool kit, shop rag, owners manual, appropriate keys, a trophy from when the bike took first prize at a national MOA meet in 1987, the “S” crankshaft balancer, and a new, properly sized wet cell battery that has not been activated. 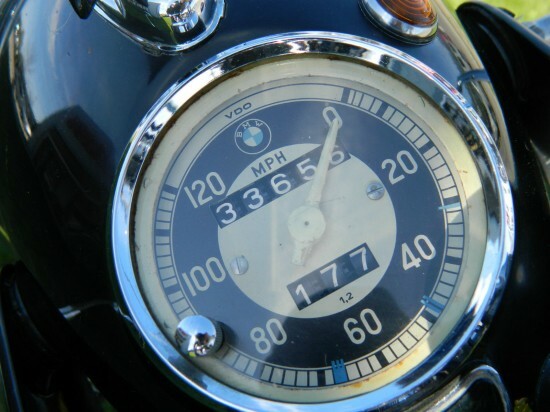 The original BMW labelled rubber battery strap, battery tray cushion, and a new hi-lo/horn wiring harness are included in the sale, but are not shown on the pictures. Now a look at the 1968 R50US. 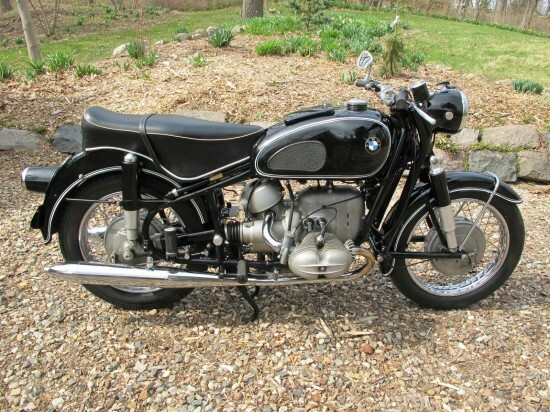 Built in the same year, painted the same way, but with a 500cc engine, without any S for sport. As you will see, there is also a change up front. 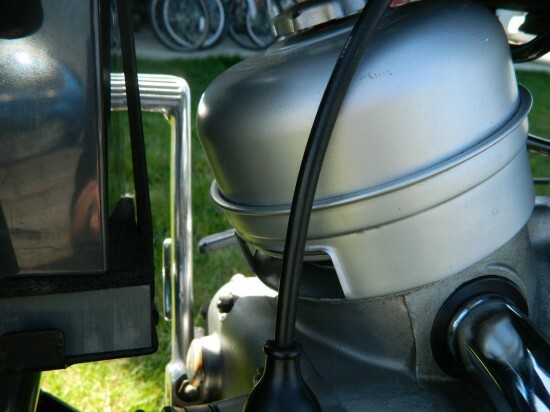 The Earles Forks of the R69S are replaces with a traditional tele-front fork. BIKE ISN’T PERFECT, BUT IT’S VERY VERY NICE. TANK, FRONT FENDER AND FRAME ARE ALL PRETTY GLOSSY AND PAINT IS VERY GOOD. THE REAR FENDER THOUGH IS A BIT DIFFERENT. DAD SAID HE BOUGHT THE BIKE AS YOU SEE IT, AND THE REAR FENDER ALWAYS LOOKED ROUGH. ALMOST LOOKS LIKE JUST A QUICK TOP COAT TO ME. I AGAIN TRIED TO GET ANGLES THAT COULD SHOW THE DULLNESS OF THE PAINT ON THE REAR FENDER. YOU’LL SEE SOME SCRATCHES, A SMALL DING IN THE PIPES IN A COUPLE SPOTS ETC. IT IS WHAT IT IS. THIS IS A NICE ONE THOUGH.